There may be a coin, token, or medal that will help celebrate any holiday or occasion. Someone looking for a collecting idea decided to find out if there was a coin for every holiday or commemoration. After searching online for the last few months, this person found over 150 coins and medals to cover more celebrations than Hallmark has cards for. I had asked for a sample of some of the finds. There were a few commemorative coins and medals from the United States and foreign made. Many are known, some were a bit obscure. 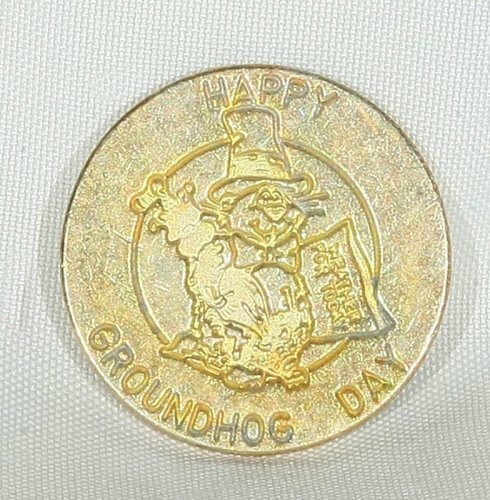 The Happy Groundhog Day Commemorative Coin is technically a medal. It is a 1½-inch gold-colored medal available from Punxsutawney Phil’s Official Souvenir Shop in Punxsutawney, Pennsylvania. For the low price of 94-cents each (and likely with added shipping costs), you can also have a medal to add to your collection to celebrate Groundhog Day. When they pulled the poor rodent out of his warm home, probably from a comfortable sleep, and paraded him around, Phil did see his shadow, thus winter will last for six more weeks. Historically, Phil and his ancestors have only been 39-percent accurate. I wonder if weatherman Phil Connors made it back to Punxsutawney for this year’s celebration?